Less than a week remaining in Black History Month, and my guy Donnovan Bennett over at the Score is making the most of it. His focus this February: Jackie Robinson. His life, his achievements and his legacy. 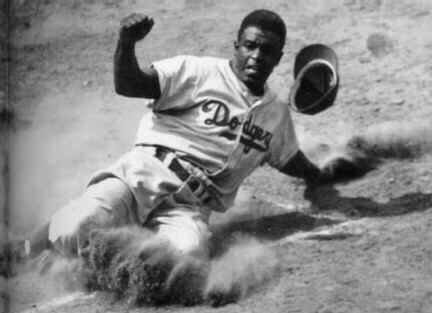 Around Major League Baseball, April 15 is also known as Jackie Robinson day, and all 31 teams celebrate by outfitting every player in Robinson’s number 42. Last Robinson day I caught up with a few major leaguers to learn their thoughts and theories about the dearth of African-American players in pro baseball. And this month Bennett explores more deeply the man who integrated the major league game in the first place, and I’m lucky enough to have been included in the piece. This was really inspirational. I appreciate that the focus of this piece was on character, and I hope to show this to my students on Monday so they can understand that there is value in not reacting negatively to any adversity they face.